DevForge Conference is an event organized by Transition Technologies PSC, where our experts aim to share with their knowledge and experience, by presenting real-life scenarios to incorporate state of art technologies. 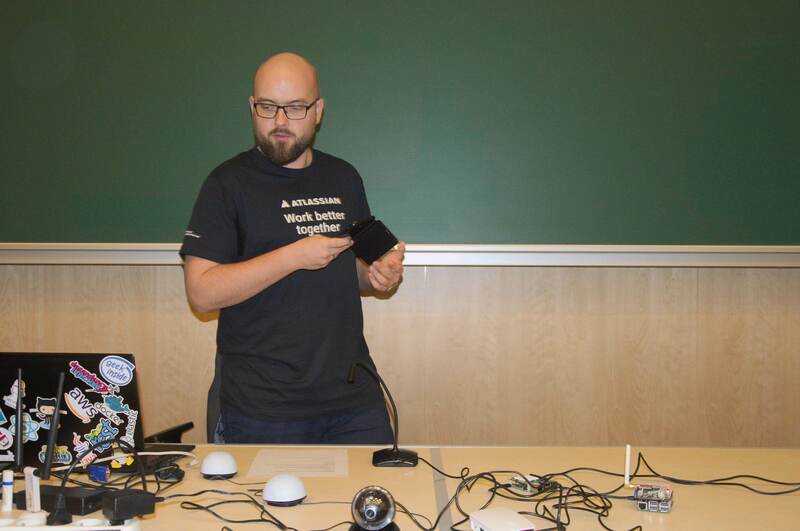 As the first edition of the event has already ended, Michał Dubel – Team Leader of Atlassian Apps had presented one of the best rated lectures on a given subject, entitled “Tell me more – build your our own AWS Alexa on Raspberry Pi”. 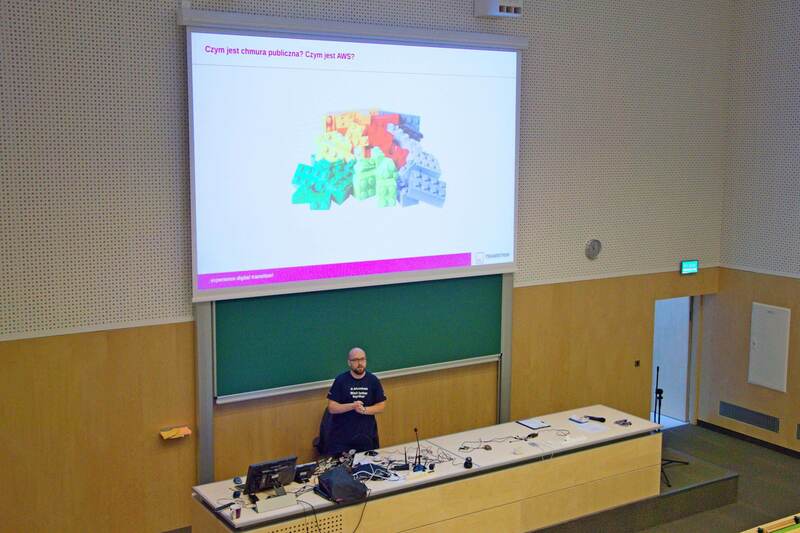 “Tell me more” – this is the cornerstone (base principle) of my lecture on which I’ve laid fundaments for further dealing with the topic of “build your our own AWS Alexa on Raspberry Pi”. By doing so, I aim both: to succeeded in arousing audience interest in particular issues and a the same time avoid information overload. Cherry on the top of it, will be when listeners’ faces will present authentic smiles. Topic selection was dictated by a will to present possibilities of public cloud in a way that is comprehensible and a the same time doesn’t lose its practical attitude. My general assumption is that when a theory gets combined and backed with real-life scenarios that can easily be tested in a non-complicated way by invited recipients (also on their own devices), it results in knowledge transfer being easier to understand. This approach will hopefully act as a pinnacle for standalone further understanding and exploration of cloud computing concept (by this I also mean to not limit scope of this technology and only to the AWS). Spreading the word, or as it can be called “evangelization” is one of the core pillars of the foundation of this lecture. If more people are to self-invest in diving deep into learning more about the mentioned (public cloud) technology then, in a nearest future we can surely expect more (long-term) ambitious and interesting projects to be realized by us. And by “us” I mean a whole IT community in Poland. DevForge Conference aims at social group of students, that is why I plan to “implant” (“embed”) an enthusiastic approach towards a will to self-study and experiment with solutions that I am to talk about. I want to go public with a presentation that will not only present raw data and solid facts, but is to enable audience to revise what was shown here (in a moderate way), in a comfort of each person living room. Hopefully it won’t be only an abstract approach, or wishful thinking of mine. As I make preparations in advance, the closer I am to the presentation date, the more I revise and enhance plan corresponding with the topic that I aim to present. Social media world starts to buzz about it with announcements and I start to feel a motivational pressure with which I feel comfortable. I plan to arrive in Białystok two days before the conference. Atlassian department of TT PSC has its own team there, with which Łódź, on daily routine, stays in touch remotely. Personal meetings with direct face to face talks surely strengthen mutual bonds and that is why I do appreciate any similar in character gatherings. Guys from the department discuss with me about present day projects and ideas and after working hours are eager to show me their city. Białystok is a charming place, where one can find tasty dishes and an opportunity to rest. In the evening you can easily spot party side of this city, by choosing out of many entertainment possibilities to spend leisure time. 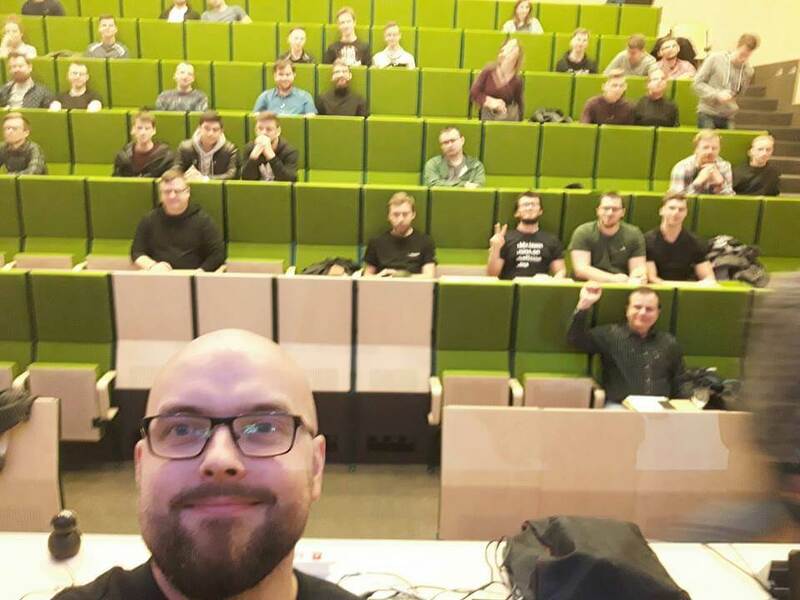 DevForge Conference is to be held in Białystok University in one of its lecture halls of Mathematics and Computer Science department. As for the whole building in general – it looks astonishing and for me – a person who is not an architecture whizz, I can without a doubt call it a gem. My feeling towards it is caused by a deep impression of it is caused by its functionality and aesthetic look, characteristic for many known landmarks. It is thanks to Łukasz Szeremeta, an assistant of professor in Computer Science Institute of Białystok University and custodian of local Science Club that has cooperated with TT PSC with the conference organization, we were able as early as on previous Friday to led a general test before upcoming Saturday lectures. All this involved checking devices, customization of multimedia, WiFi network and checking if anything stays on its right place, not forgetting about getting familiar with local lecture hall secrets. Conference is to start at approx. 9.30 AM local time. Interested in the topic attendees will first meet girls from HR Team of our company and with representatives of Clurgo company, which is our business partner. Next, guests are to be directed to an auditorium to face pale moon-faced guest speakers and feel characteristic aroma of their sweat-wet (no pun intended) armpits. Of course I like to joke about such things/topics and surely it hasn’t happened (or at least anyone locked in an auditorium with us was polite enough to stay silent about it, if anything “extraordinary” was noticed). Anyway, going back to the point – my presentation, according to meeting schedule, has been planned to start at around noon. What worries us the most here is the pre-lunch time of our lecture. Hungry audience do not accept boredom, as low sugar levels in their blood will likely force them to take a nap, or act if they weren’t themselves (in case of no Snickers in the pocket) – we must do everything to keep audience alive and kicking. Lecture hall greets us with familiar faces of TT PSC Atlassian Białystok Team, which makes me feel a little bit more comfy. Initial stress helps to prevent any rude awakening to happen and mobilizes me to getting things done and start to act professionally. I always do my best to stay in touch with an audience – an easy trick of keeping eye contact with different areas of the lecture room does the job. It wouldn’t be me if I hadn’t told a few awkward jokes during my speech, which strangely are met with smiles (possibly caused also by their politeness). Nevertheless, it makes me feel more confident and I start to feel that we are now on the same wavelength and thanks to that I hope and aim to enhance mutual relations with my listeners. I present how via the AWS one can make, even in its own backyard via Raspberry Pi (or on any other PC) your own Amazon Echo. For many it may sound unfamiliar, but in reality it’s a device enriched with AWS service – Alexa that allows to use voice commands for controlling multiple of applications and devices. Lecture attendees seem to be engaged and thanks to this I can swiftly move on to further parts of my presentation, totally forgetting about stress. I present, how to incorporate Amazon’s Public Cloud via a couple of services and a little bit more mouse clicks plus several dozen line codes to get a final result, which even in not so distant past would had required more of personal input. Crucial element of the lecture is a direct presentation of mentioned technology. A moment when I can get my hands dirty and show how my works looks in reality is the best note, easily hardcoded into memory by my listeners. This way of doing a presentation is for me the best for speeches limited by time to one hour. Final result of o demo is a device that (controlled via voice commands) can make a photo of an audience, start face recognition module (AWS Rekognition) to upload on twitter previously made photo with a comment pointing out a mood of gathered people. A useful device for any lecture speaker who wishes to know instantly an attitude of its audience (whether they are interested, bored and maybe even scared of what has been presented to them). I end my presentation with a strong feeling of mission accomplished and spending my time in an useful way. Later I’ve found that I am not the only one with such feelings – the best evidence of it is positive feedback in a questionnaire distributed after finishing my speech. During and after the speech I’d been asked about particular technological solutions and about more general questions – like how to become a software developer of Java or Python. I do appreciate any opportunity of meeting with youth people that wish to pursue their career in IT field. For me, presenting them with technology that they wish later to explore and learn by themselves has a huge value. This approach enables to feed market with competent people, thanks to whom it will be possible to realize really interesting and inspiring projects. And as a last but not the least – we create a desire for learning and development among audience.